Aging symptoms such as wrinkles, fine lines, and creases on your face can betray an older, tired appearance regardless of how vibrant and vigorous you feel. With treatments like Botox, you have the power to reject the effects of aging and protect your natural, youthful face. A elegantly simple, but effective injectable treatment, Botox can prevent the development of facial wrinkles and preserve your natural youthful beauty. Contact Dr. Brown at either of our offices in La Jolla, Coronado, or Del Mar to learn more about the incredible anti-aging abilities of Botox! 1 What are Botox Injections? 7 How does Botox Work? BOTOX Cosmetic is an injectable medication that smoothes facial lines by relaxing facial muscles, creating a more youthful, happy, and positive impression. Patients benefit from this medical injection that works to temporarily relax muscles. Botox Cosmetic is a dermal injection created from the purified botulinum toxin A. Because of its purified form, there is zero risk of adverse effects from the chemical. The contractions of these muscles are what give rise to wrinkles, often called “dynamic” wrinkles because they occur during movements such as smiling or talking, often creating an unintended worried or aged expression. Botox Cosmetic is an easy procedure that works effortlessly and effectively to relax the muscles whose contractions cause the excess wrinkling. The results of Botox Cosmetic injections are straightforward: a face that is smoother and happier-looking. Greeting people with a relaxed, pleasant smile creates the impression of youth and is indicative of an inner state of well-being as well as an outward sense of personal attractiveness. After the Botox Cosmetic injection, the wrinkle-forming muscle contractions are relaxed and your face appears smoother and wrinkle-free. After the treatment, many clients look in the mirror and smile at what they see: a face whose appearance of happiness and youth has been heightened. The effects of Botox Cosmetic treatments can feel dramatic, but the procedure itself is low-key and innocuous. The result is a subtle rejuvenation of one’s appearance that might lead an acquaintance to think a particularly relaxing vacation was just enjoyed. Subtle, discreet, and effective, Botox Cosmetic injections can suit the needs of a wide range of individuals. Smile lines and facial wrinkles created by facial muscles define our faces and show our positive emotions, but may also be seen as frown or scowl lines. Botox Cosmetic treatments can relax specific facial muscles leading to smoothing of crow’s feet, frown lines, and forehead wrinkles, making your skin look more youthful and rejuvenated, and showing a more positive outlook. Botox Cosmetic treatments even have the potential to prevent new wrinkles from forming. Botox can also prevent embarrassing social sweating. Underarms and palms can be treated so that minimal if any perspiration occurs, even on the most stressful occasion or life event. A single treatment can keep you dry and confident for up to 6 months. You purchase 3 areas of Botox upfront to earn 1 free area of Botox. This gives you 4 Botox treatments for the price of 3. In other words, you earn a 25% discount on all 4 Botox treatments by being a club member. You can have separate visits. So for example, you can have a 2 area Botox treatment at one appointment and a 2 area treatment at a separate appointment. Club benefits can’t be combined with any other special offers. Complimentary numbing cream keeping you comfortable and relaxed during your treatment. Complimentary touch up if needed after 7 to 10 days to ensure that you get the results you desire. Botox Cosmetic injections can be combined with other cosmetic treatments with incredible ease. For example, Botox Cosmetic injections can be combined with the injectable fillers Sculptra, Radiesse, and Juvederm, as well as other non-surgical facial procedures. The Juvederm procedures take a scant 15-minutes to perform, and even strenuous physical activity can be resumed within hours. However, we recommend patients take it easy immediately after any cosmetic treatment. Combination procedures involving dermal fillers are simple, consisting of an injection of gel into any hollow sections under the eyes or in the cheeks to create a perkier, lifted appearance. Clients go for Botox because it can so easily and effectively be combined with other skin treatments. Botox treats problems caused by muscles contractions beneath the skin, while dermal fillers such as Juvederm work to fill in wrinkles and creases. In fact, the most comprehensive results for facial rejuvenation occur when Botox is used in conjunction with dermal filler procedures, such as Juvederm. Clients across the country choose Dr. Daniel J. Brown M.D. because he is noted as an artist of human anatomy. 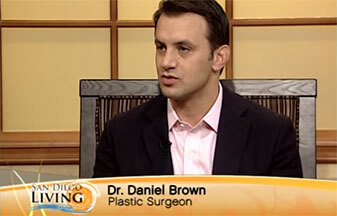 Again and again, people choose Dr. Brown because he is rated among the top in the field for his patient-care. Nearly any healthy adult can be an eligible candidate for Botox Cosmetic treatments. It is a desirable option for appearance-savvy individuals who are interested in immediate, affordable, and subtle results. While traditionally this treatment was used by those in their 40’s and 50’s, an increasing number of younger clients are utilizing Botox Cosmetic treatments for its uniquely preventive nature, as it stops new wrinkles from forming while the injection is in effect. And, the effects are temporary. This treatment can be enjoyed without committing to financial cost of a facelift, or the psychological cost of committing to a permanent physical alteration. Those most satisfied with Botox Cosmetic injections are often people who simply seek a gentle, affordable method for improving their appearance and putting a stop to the effects of aging. Botox Cosmetic treats specific muscle groups by communicating directly with the facial nerves responsible for those wrinkle-causing contractions in the first place. The Botox Cosmetic injection is also preventive. While the facial muscles are relaxed, it works holistically to keep new wrinkles from forming. Because the muscles are not contracting, new wrinkles are not being formed. The procedure can be completed on a lunch break and there is no downtime required. A minimal application of foundation is always more than adequate to cover up any minimal redness that occurs at the site of the injection, although it is advised that clients remain in an upright position for the remainder of the day. After treatments dissipate in three-to-four months, patients can either resume further treatments. Botox treatments are performed in the privacy of our state-of-the-art offices. There is no need for significant preparation as the treatment is administered while you are awake and resting comfortably. The entire injection process can take as little as fifteen minutes to half an hour. Topical numbing agents or numbing creams may be available for those who do not tolerate the injection process well. The injection phase is predetermined during your consultation as Dr. Brown maps and discusses the specifics of each injection and how they are aimed to address a particular issue. The injection methodology requires experience, expertise and an artistic eye for achieving natural-looking results. Inexperienced or poorly-trained practitioners may leave your appearance looking “frozen” with obvious signs of treatment. With Dr. Brown, you can rest assured that you are in the absolute best of care. After the injection phase, cold compresses or ice packs are available to ease any discomfort at the injection site. Otherwise, you can be on your way back to your normal, daily routine! Clients begin their journey with a stress-free consultation with Dr. Brown at either the San Diego or La Coronado office. Dr. Brown will personally meet with you to listen to your specific desires, while assessing your goals. We recommend patients bring in younger pictures of themselves, which can serve as a frame of reference for their aesthetic goals. During your consultation, you may point out areas of concern and signs of aging that worry you the most. Then, Dr. Brown will develop a fully personalized treatment course and walk you through each step in detail. Our aim is to leave you feeling 100% confident and comfortable with the benefits you are about to receive from treatment. The pricing of a Botox treatment varies from patient to patient depending on the size of the area treated or whether or not Botox is included as part of a comprehensive treatment package. You will receive a specific quote at the time of your consultation.